First thing that needs to be done it to finely ground 2 cups of Graham Crackers. The easiest way to do this is with a food processors. If you do not have a food processor try your best, maybe put your crackers in a Ziploc bag and smash them. Next take a 9x13 dish and line it with wax paper leaving a few inches on each side. Taking about 25-27 butter crackers and lay out crackers in dish, covering bottom. Set aside your 9x13 dish, and start melting your butter in a sauce pan. Mix in your milk and sugar. Bring to a simmer and gradually stir in your graham cracker crumbs. Simmer this mixture for 5 minutes, stirring frequently or else it will get stuck to bottom of a pan. Once mixture has thickened, take 1 cup of it and spread on your crackers. This part can be tricky because the crackers like to stick and move with mixture. Just try your best to evenly spread it out. Add another layer of crackers and spread of mixture. This layer is easier to do because the crackers are stuck in place with the first layer. Once the mixture is spread evenly, add another layer of crackers and set aside. In double boiler melt chocolate and peanut butter chips. If you are like me and not have a double boiler, put your chocolate and peanut butter chips in a medium bowl. Place your bowl over a pot with a small amount of simmering water on low. 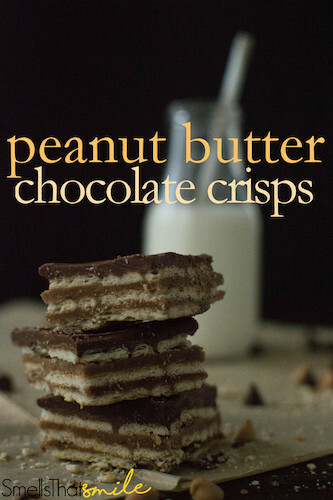 Once your chocolate is completely melted and mixed together, spread it on your final layer of crackers. Place your dish in the refrigerator for at least 1 hour. I think the longer it sits the better the tastes. When its ready and you take it out of your refrigerator, grab the ends of the wax paper and pull out of dish. With a sharp knife, cut your crisps into the desired size. Some people prefer it when I keep the crisps chilled in the refrigerator and some like it when they stay room temperature because the chocolate is softer, so storage temperature is up to you! With a food processors, finely crush 2 cups of Graham Crackers. If a food processor is not available, try your best to smash Graham Crackers in a Ziploc bag. Line a 9x13 baking pan with wax paper, leaving a few inches on each side. Then create bottom layer of Butter Crackers, laying 24-27 crackers side by side. In a saucepan melt Butter. Once melted, mix in Milk and Sugars. Bring to a simmer and gradually stir in Graham Crackers. Simmer for 5 minutes, stirring frequently. Melt Chocolate Chips and Peanut Butter Chips in a double broiler. If you do not have a double broiler, put Chips in a medium bowl over a medium sauce pan with simmering water over low. Stir until chocolate is smooth, then spread over top layer of crackers. Place dish in refrigerator for atleast1 hour until set. Once ready, take out of refrigerator. Carefully grab ends of the wax paper and lift crisps out. Place on cutting board, and cut into desired size pieces with a sharp knife.